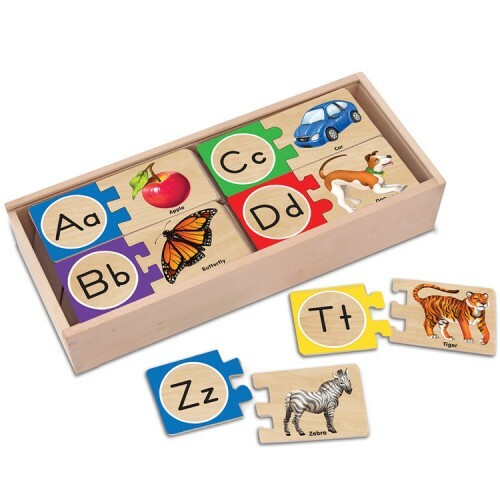 The Alphabet Wooden Puzzle Cards by Melissa & Doug is a great way to introduce all young children to their ABCs. Alphabet learning for kids of any age! The Alphabet Wooden Puzzle Cards by Melissa & Doug is a great way to introduce all young children to their ABCs. Each puzzle card set includes 26 upper- and lower- case letter pieces and 26 vibrantly illustrated pieces that match each letter. Match the A to the apple, the B to the butterfly, the C to the car and so much more! Each self-correcting piece is unique, so you'll know when you've made a correct match. 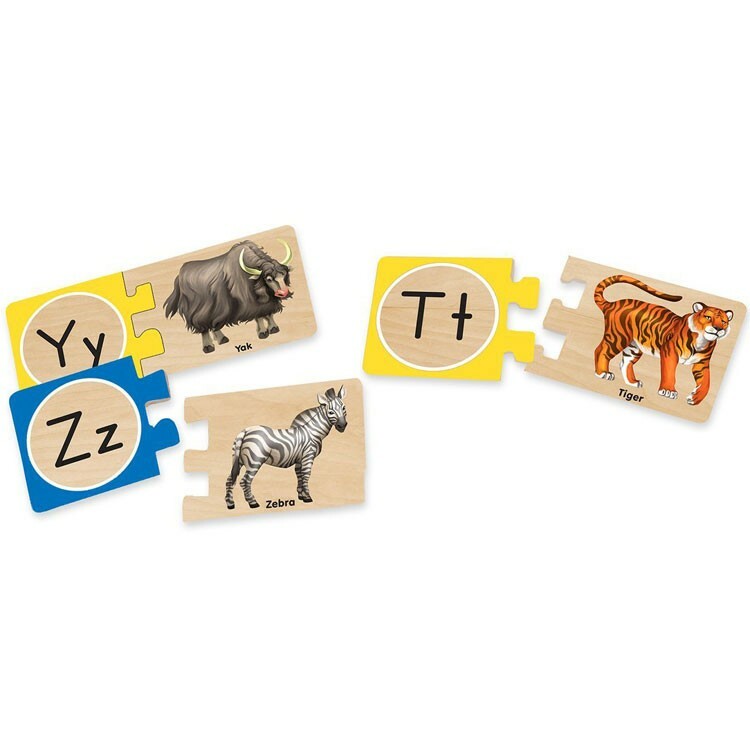 The Alphabet Wooden Puzzle Cards set from Educational Toys Planet features easy-to-grasp, durable wooden puzzle pieces with smooth edges and meets all the highest safety standards. Each beautiful illustration is hand painted with vibrant non-toxic paints. When it's time to clean up, all puzzle pieces fit neatly in the wooden storage box. 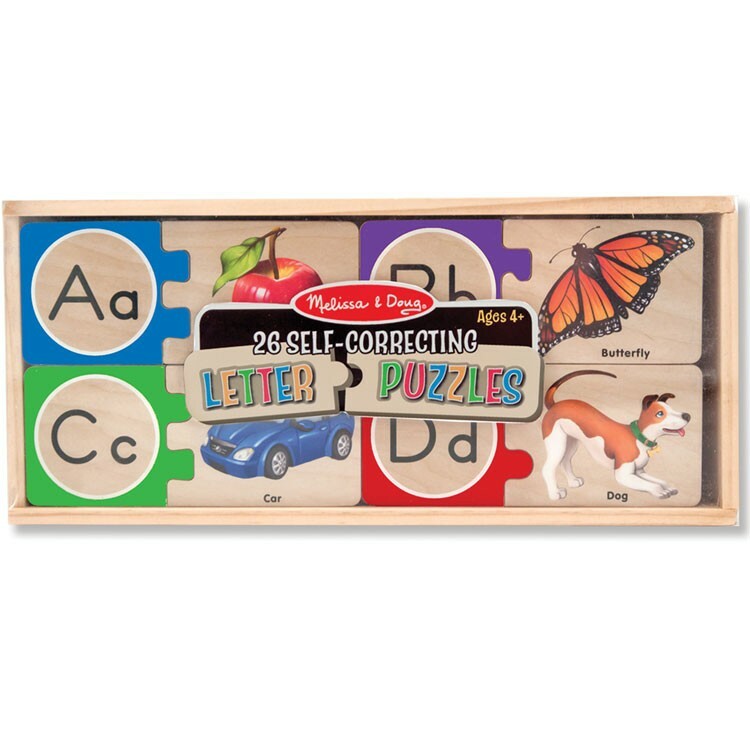 This durable Melissa & Doug set is sure to become a family favorite for generations. Introduce your little one to the alphabet, early language arts skills, and fine motor development. Write your own review of Alphabet Wooden Puzzle Cards. Rating: 5 Great idea by Jessica G This is a great idea and super cute. If your child is learning the letters ad their sounds then this is the perfect toy for them. They can "check" their own work because the pieces won't fit unless they have the correct match. It is also brightly colored and the illustrations are beautiful. Perfect for any preschooler, kindergartner or 1st grader. It would also be great for older kids still struggling with their letter sounds or for adults with dementia.